Living up to the bank’s core value of Malasakit, Rizal MicroBank employee volunteers came together and held a BrigadaEskwela activity on May 20, 2017. 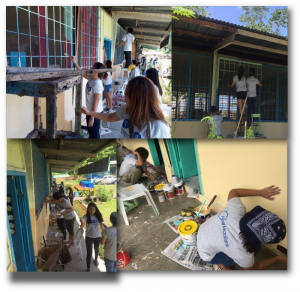 The Davao Head Office staff volunteered to repaint the classrooms and other school facilities using the donations from other bank employees. Living up to the bank’s core value of Malasakit, Rizal MicroBank employee volunteers came together and held a BrigadaEskwela activity on May 20, 2017 in support for the Department of Education’s (DepEd) annual school maintenance program which urges private corporations and organizations to help fix up schools before the opening of classes. As part of RMB’s Corporate Social Responsibility in providing inclusive development of the nation by giving back to the community, the bank chose to support San Miguel Elementary School, which is located at Bunawan, Davao City. The school, which only has one building and composed of three classrooms, can accommodate a total of 104 students from kindergarten to grade school. Headed by First Vice President – Head of Branches and Lending Operations Group, Ms. Emelita B. Rocero, with the full support of Bank President, Mr. Raymundo C. Roxas, RMB employee volunteers took time out last May 20, 2017 to do minor repairs, painting and clean-up work for the school. 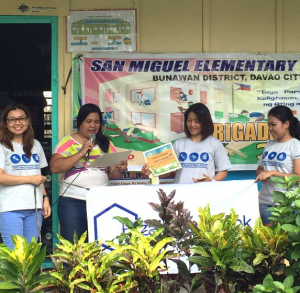 After the whole-day activity, Ms. Analyn Tiongson, Principal of San Miguel Elementary School, expressed her gratitude by thanking Rizal MicroBank for choosing their school as its beneficiary for this year’s BrigadaEskwela. “We are hoping that next year and in the coming years, Rizal MicroBank will be able to support more schools in the different areas where we operate as a way of giving back to our community,” Rocero shared. Indeed, we can truly rise as a company by lifting and helping the communities where we operate. Principal Analyn Tiongson awarded a Certification of Appreciation to Head of Operations, Emelita Rocero.